During the SIHH 2013 exhibition in Geneva, I already put on-line some pictures of this watch on our #instagram account. 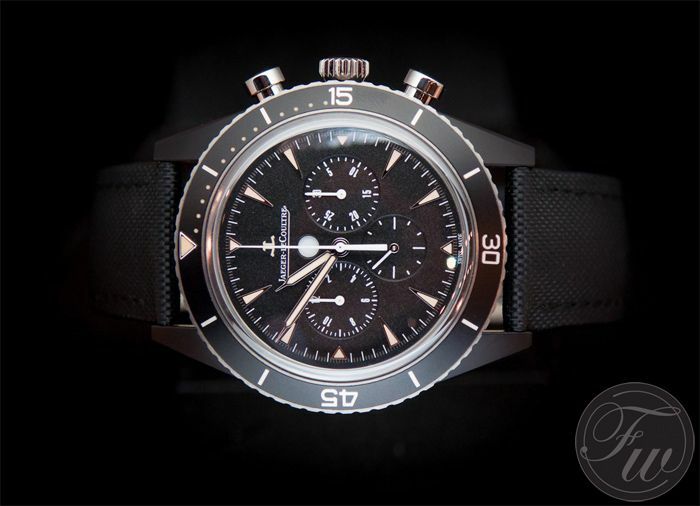 However, there was no time yet to write something decent about the Jaeger-LeCoultre Deep Sea Chronograph Cermet watches. Undeserved. I love chronographs, especially vintage ones. 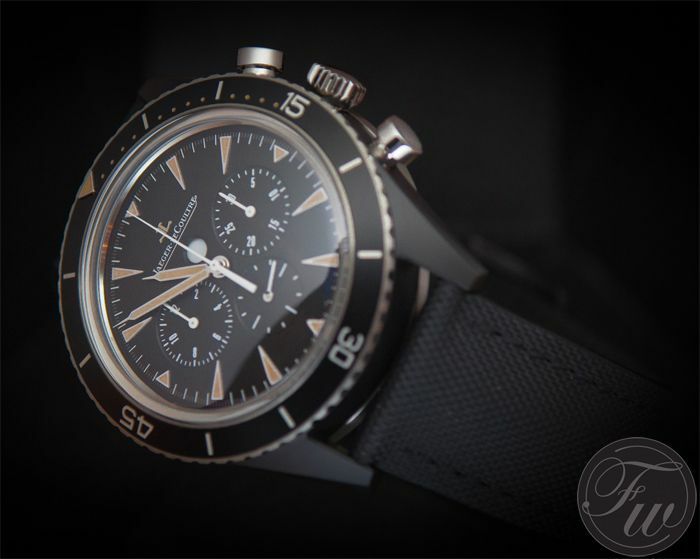 This Jaeger-LeCoultre Deep Sea Chronograph has clearly been inspired by their 1950s Memovox Deep Sea models. Although I like the alarm complication, I rather have a chronograph watch to be honest. This Deep Sea Chronograph Cermet comes in two different models. The one pictured above and the ‘Vintage’ edition (pictured below). The vintage looking model has a nice patina look on the hour markers, hands and bezel. Both watches have the same specifications, a grained dial, an in-house developed Jaeger-LeCoultre caliber 758 chronograph movement and the cermet case. The Cermet case is a high-tech material that consists of aluminium reinforced with tiny parts of ceramic. The case is then being protected with a coating layer of ceramic. Besides being very light, the Cermet material should also be resistant to scratches. Although the case size of 44mm might sound big, I’ve found it to be quite comfortable on my wrist. Also due to the elegant shape of the case and the textile strap that comes with it. You have probably noticed the white round aperture on the dial of this Jaeger-LeCoultre Master Extreme Deep Sea Chronograph. In our photos, it is white. However, it also has two other positions, which are red and red & white. White means that the chronograph is not in use (zeroed) and ready for use. When the chronograph is being started, the aperture will turn red & white. This means that the chrono is in use. When stopped, the aperture turns red. 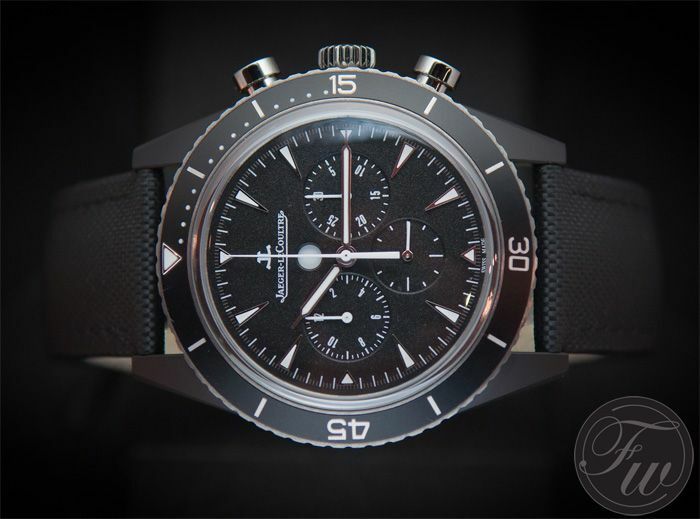 Jaeger-LeCoultre implemented this chronograph operation indicator because a diver should be able to see in a glance whether the chronograph is either running, stopped or ready for use. Like I wrote before, both timepieces have the same technical specifications and only differ in some aesthetics. 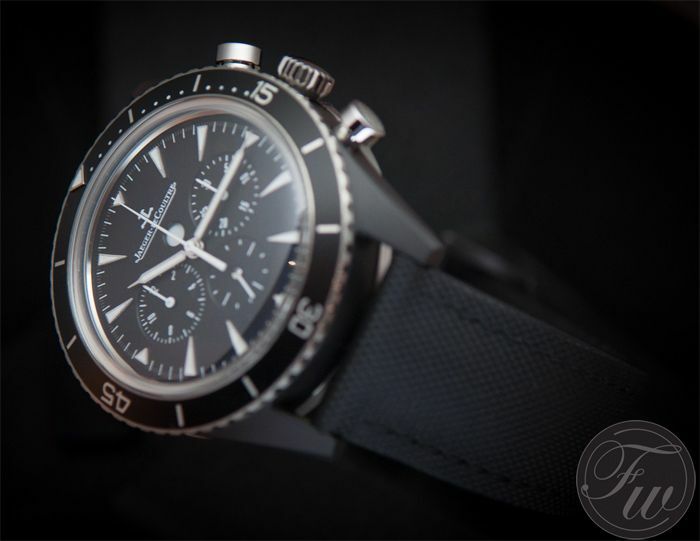 The Jaeger-LeCoultre Deep Sea Chronograph 208A570 is the ‘normal’ version with white hour markers, bezel printing and hands. The reference 207A57J is the vintage version, with yellow-ish patina on the hour markers, hands and bezel. It is a matter of taste really, although we all know that modern luminous material will never discolour like tritium does. Jaeger-LeCoultre is not the first manufacturer that creates artificial patina, but I actually like the look of it. There is no difference in price of these watches. Both have a 10.000,- Euro price tag on them.